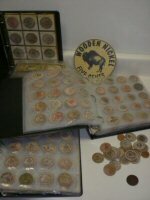 I collected coins as a child, now collect religious and other medallions as a part of my Skeptiseum collection (see www.skeptiseum.org), and also collect wooden nickels. (My own wooden-nickel business card bears a version of a skeptical expression, "Don't Take Any Other Wooden Nickel.") Part of the latter collection is displayed here.